OKLAHOMA CITY (Aug. 22, 2017) – State Superintendent of Public Instruction Joy Hofmeister today announced a student art contest to design a new specialty license plate benefiting education. Proceeds from the purchase of the specialty plates will be used to bolster teacher recruitment efforts in Oklahoma. 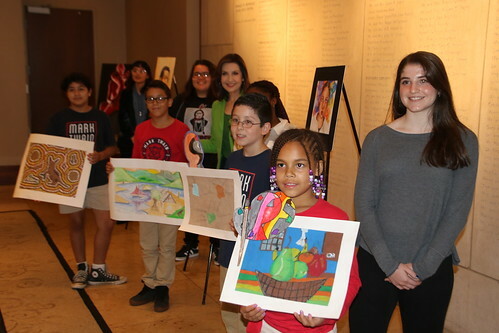 In the License to Educate contest, students in Pre-K through 12th grade may submit original artwork, with the winning design ultimately selected by Oklahomans in an online vote. The Oklahoma State Department of Education (OSDE) will accept education-related artwork for the plate through Sept. 22. Students may submit entries digitally through the OSDE website or by mail. Entry forms are available on the OSDE website. The agency will narrow down submissions based on creativity, aesthetic appeal, and relevance to public education in Oklahoma. Finalists’ submissions will be posted online Oct. 9, and the public will be able to vote for their favorite through Oct. 20. Hofmeister kicked off License to Educate at a Tuesday news conference at the Oklahoma City Museum of Art. “It seems only fitting that our schoolkids be the ones to design the specialty plate that benefits the very education system in which they are learning. We are excited to see their submissions and are confident the judges will have a difficult choice selecting the finalists,” Hofmeister said. The Oklahoma License to Educate license plate was created through legislation authored earlier this year by state Sen. Stephanie Bice and Rep. Ryan Martinez. The license plate will cost $35 and be available for pre-order shortly after Nov. 1. For more information, visit the License to Educate web page. View more images from today's press conference.